106XL025 BANDO Timing Belt*. Industrial Grade. 10.6” Length. 53 teeth. 1/4” (0.25”) wide. Neoprene (black rubber) replacement “106-XL Series” industry standard Timing Belt. Popular replacement belt for electronic equipment and power tools such as power sanders, woodworking tools & lathes, pumps, and robotic equipment. Toothed Gear Belts marked “106XL” at 1/4” Width. *CLEARANCE PRICED WHILE SUPPLIES LAST. ALL SALES FINAL. NO RETURNS. 106XL031 Timing belt replaces A6R3-053031. 106XL031. 10.6 inch. 53 teeth. 106XL031 Replaces A6R3-055037, 106XL-31, 106XL 031G. Neoprene Synchro-Link Timing belt. Replaces Harbor Freight/Central Machinery Part 106XL 031". 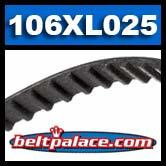 106XL037 Timing Belt: 10.6" Length, 53 Teeth, XL (.200") Pitch. Replaces: Jason 106xl-037, Gates product 92571362, OPTIBELT-ZR 106 XL 037.